Ever since the late 1960s, the eugenics movement has been subjected to a withering assault by a group of largely Jewish biologists who argue that evolution can take the form of sudden, radical change in species that have previously remained relatively stable over the ages. This ‘punctuated equilibrium’ theory stands in sharp contradistinction to Darwin’s concept of small, gradual changes that cumulatively produce major changes. The debate might appear to be a recondite scientific theory, but in point of fact it is of overwhelming political significance and even determines our vision of who we are. These counter-Darwinians maintain that human beings constitute a species for which evolution has come to a grinding halt, that non-trivial inter- and intra-group genetic differences (even the difference between men and women) are mere ‘social constructs,’ that intelligence is neither heritable nor measurable, that eugenics was rejected by scientists as early as the 1920s, and that Hitler’s support of the movement compromised it irretrievably. Ironically, this denial of biology occurred simultaneous with a revolution in our understanding of the genetic mechanism. In response, the philosopher and member of the Jewish Academy Leo Srauss coined the maxim “reductio ad Hitlerum”: Hitler believed in eugenics. X believes in eugenics. Therefore X is a Nazi. The fact that many Jewish eugenicists perished or were exiled under Hitler (and Stalin) is ignored, as is the public condemnation of Hitler’s government by prominent Anglo-American eugenicists. The assertion that eugenics is ‘anti-Semitic’ must have dumbfounded at least two of the Presidents of the American Eugenics Society—the anthropologist Harry L. Shapiro (1956-1963) and the demographer Michael S. Teitelbaum (1985-1990), and two of its Vice-Presidents the obstetrician Alan Guttmacher (early 1940s) and the geneticist Irving Gottesman (1976-1981), not to mention the Society’s many other Jewish officers and members. Eugenicists maintain a pro-Darwinian position and counter that no biological species can survive without selection, and now that the overwhelming majority of people live well beyond their fertile years, selection by mortality has been largely replaced by selection according to fertility. A society that encourages its intellectually fortunate to pursue their careers at the expense of childbearing and that relies heavily on the intellectually disadvantaged to constitute its breeding pool inevitably goes into decline. On the plane of physical health, we are faced with a second dilemma: the very purpose of medicine is to free us from the process which created us and maintains us viable as a species—natural selection. Eugenicists reason that virtually all social, technological, and political processes affect fertility and that it is entirely possible to influence future evolution, and do so with compassion, within the context of a democratic society, but that we must first open our eyes to what is taking place in modern society. Even the Holocaust as a genetic loss is a taboo topic in the eyes of the Counter-Darwinians. Contrary to their assertions, Jewry is itself the product of millennia of eugenic selection, and Israel remains a relative bulwark of eugenic practices even today. One of the central warnings of the eugenics movement is that intelligent people aren’t having enough children. Jews are no exception, and it is the supreme irony that this tragedy is being dismissed by Jewish thinkers. The topic of Jewish eugenics has been even more systematically suppressed than eugenics in general and is only now being timidly taken up by a handful of Israeli and American scholars. John Glad lays bare the deepest roots of the Middle East political standoff—roots that are little known even to experts in that field. Even discounting the topic’s Jewish aspects, Glad’s study stands alone as a unique narrative history and essential reference tool on the entire historical and current eugenics movement. The author, himself an early participant in the Holocaust Memorial Movement, systematically documents the incredible disconnect between eugenics and its depiction in the popular media. “Glad’s eye-opening book is a monumental achievement,” Igor Jacov. Birman, Ph.D. “John Glad presents a masterful account of how the Jews have acquired their high IQ,” Richard Lynn, University of Ulster. “No matter what their own perspective, readers will find this comprehensive account both informative and provocative,” Don Peretz, State University of New York, Binghamton. “This book is a must for any historian of recent Jewish history,” Gerhard Meisenberg, Ross University of Medicine. “As a journalist I welcome this long overdue, truly unique, scrupulously honest study,” Arkady Abram. Polishchuk. 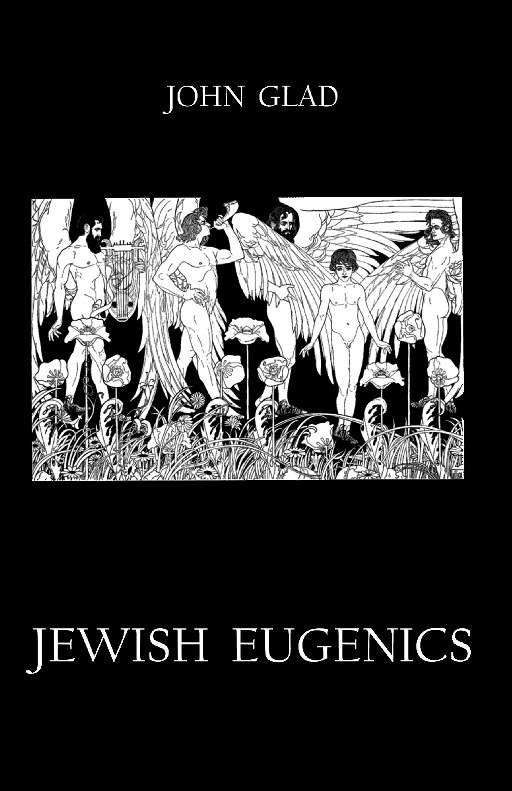 Download Jewish Eugenics in pdf format (text only, no cover) for free. John Glad is a retired professor of Russian studies (University of Maryland, University of Iowa, University of Chicago, Rutgers University) and the former Director of the Kennan Institute for Advanced Russian Studies in the Woodrow Wilson International Center for Scholars. He was the chief translator of The Black Book: The Ruthless Murder of Jews by German-Fascist Invaders Throughout the Temporarily-Occupied Regions of the Soviet Union and in the Death Camps of 1942-1945 (Holocaust Library). 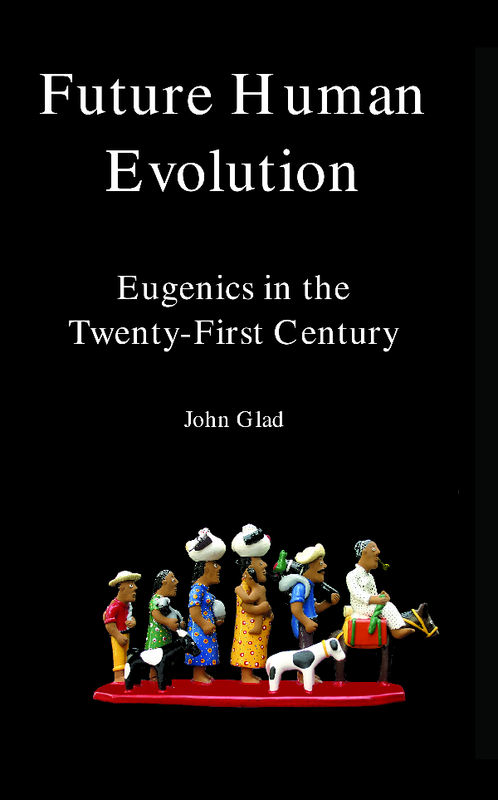 Jewish Eugenics is an outgrowth of Glad’s 2006 book Future Human Evolution: Eugenics in the Twenty-First Century , Preface by Seymour Itzkoff, Smith College. The most widely read book—by many multiples—ever written on human ecology, it can be downloaded free of charge in any of 13 languages at http://www.whatwemaybe.org.